Infinity is a mighty long time. The problem with infinity is finding it's beginning or it's foundation. This is the crux of the problem of Infinite Regress. This is an issue that crops up throughout Philosophy but probably most notably where epistemology and cosmological arguments are concerned. For the uninitiated Epistemology is concerned with how and what we can actually have certain knowledge of, and Cosmology is concerned with origins or beginnings, most notably of the universe. We'll focus on Epistemology for today's purposes. In terms of knowledge, if one argues that all knowledge is dependent upon that which can be demonstrated or pointed to we run into the problem of infinite regress. A is cause by B, which is caused by C, which is caused by D, and so on and so on Or "we can know A because I can demonstrate A for you." It follows that any thing which we must claim to know, we must demonstrate, or we must point to that thing's cause. There are some causes that we cannot demonstrate or recreate, therefore one might conclude that we cannot know anything with certainty, or that we must go on demonstrating those causes infinitely. Where does it end? 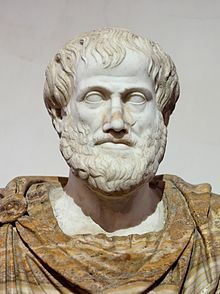 Aristotle holds that this hunt for first causes ends in immediate truth, or what he called first principles. Dependent upon the context, if we're speaking cosmologically the first principles would be material causes, which Aristotle boiled down to elements. Back then these were air, fire, water and earth, this has evolved into our greater understanding of atomic elements. For epistemology Aristotle points to axioms or self evident principles. These cannot be deciphered using scientific, practical, or philosophical knowledge. Rather than can only be got at via intuitive reasoning. For example, in the Declaration of Independence Thomas Jefferson stated "we hold these truths to be self evident." This is an example of Aristotlean thinking, so TJ might say "while I cannot demonstrate for you that all men and women are created equal, it is something we can assert based on intuitive reasoning. We can in fact know that." What does this have to do with wine? Well not much unless you look at the label of today's Friday Find, the 2011 Viognier from Martinez & Martinez winery in Washington. Where does it end, and where does it begin? Does one go on saying Martinez & Martinez & Martinez & Martinez, etc ad infinitum? I don't know? Aristotle would say it wasn't necessary. Instead he'd say what we can know about this wine is that it's got great floral and stone fruit aromatics and a ripping acidity. Pair it up with some spicy food or sip it alone as the weather warms up. 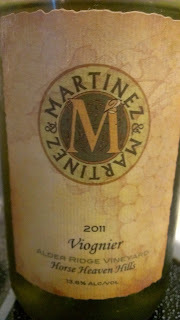 It's got great fruit flavors and a brightness that comes for a mere $13. Aristotle would approve.